All photos courtesy of NHYM 2016. I was having lunch with a friend at Granger the other day, when she started moaning and complaining about the dire amount of lunch places in Notting Hill. ‘I’m so sick and tired of Granger and Daylesford!’ she moaned. It doesn’t help that we are in January and the most depressing day of the year was around the corner (and luckily we both survived D-Day, which was Monday January 4th). It is true that there are very few places in Notting Hill, once you’ve been through the triad of Granger/Daylesford/202. 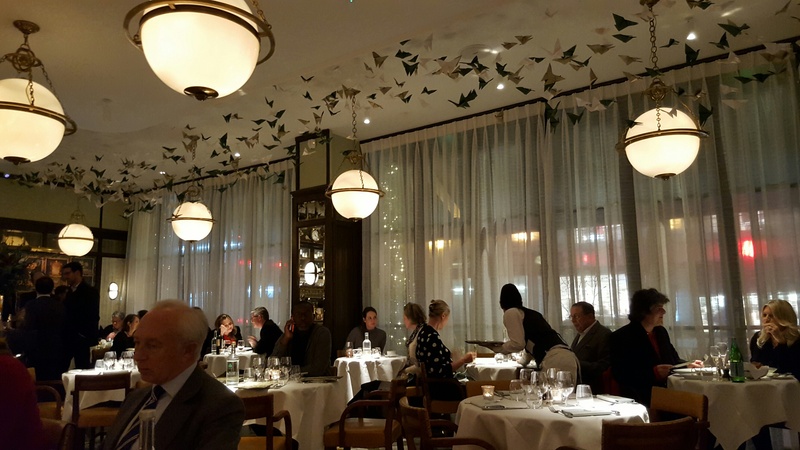 So, I was very excited to be invited by the Ivy Kensington Brasserie the other day, to try out their new outpost on High Street Kensington. 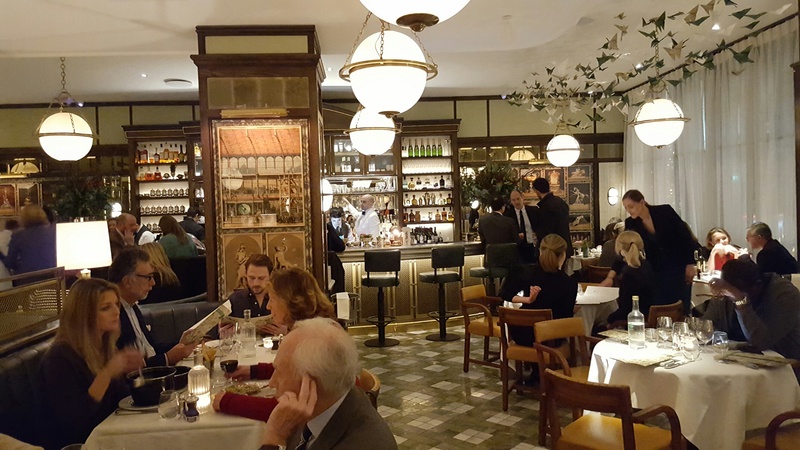 The Ivy Kensington Brasserie, an off-shoot of the very famous original Ivy, and its myriad of underlings; Ivy Marylebone, Ivy Chelsea, is now the latest of the Caprice Holdings Ivy Franchise which recently opened in December. Friends of friends who went during the opening weeks liked it so much that they went for New Year’s Eve. I dare say, that it’s my new favourite out of the franchise, although I have not been to the revamped Ivy (too far) and the Ivy Chelsea felt too big for me. I like my brasseries and this one is a perfect example of French- Brasserie-meets-British-old-school. I took one of my newly single friends who has just gotten out of a 15 year relationship and needed a little cheering up. I loved the design of the Ivy Kensington Brasserie. Like I said, it is French-Brasserie-meets-English-old-gentleman’s-club-in-the-middle-of-High-Street-Kensington. Perfect! It has marble floors, big white spheres of lighting and a flutter of origamis in flight, which just work. 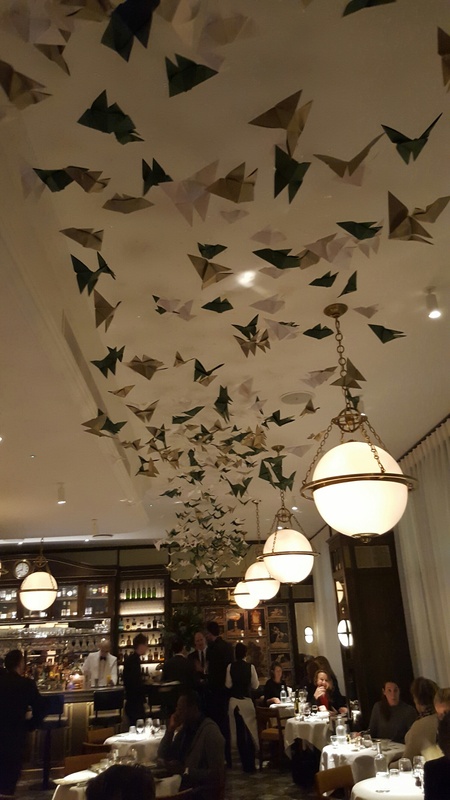 The thought of origamis flying on a ceiling could have been quite questionable, but in this case, it adds a lightness and playfulness to the room, which could have veered towards a heavy, old school brasserie. The room is cosy, even though the space is quite big and has multiple areas to sit in. We had a great view of the whole restaurant, spying on Piers Morgan sitting diagonally from us, and we spotted quite a few Notting Hillers and South Kenners that we knew and now have somewhere to meet in the middle. 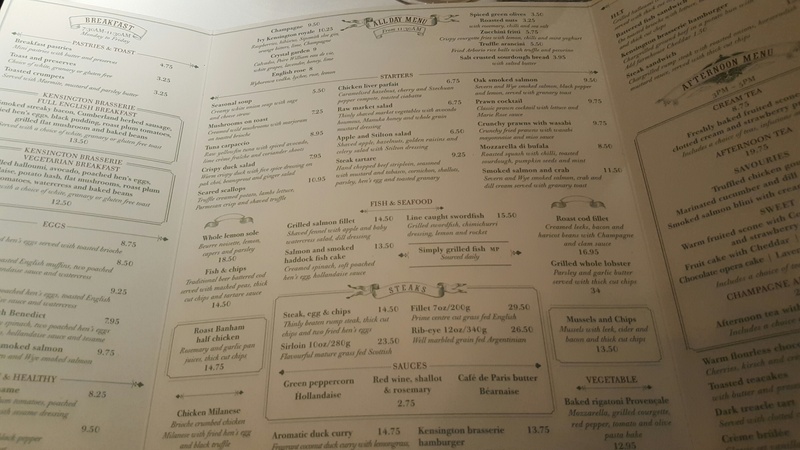 The menu had a very large selection of brasserie-style dishes from fish & chips for the Brits, to onion soup and moules-frites for the Frenchies. There is also a very alluring brunch menu with lots of avocado, which happens to be the food of the moment. We opted for a duck salad and tuna carpaccio as starters and the swordfish and dover sole as mains. 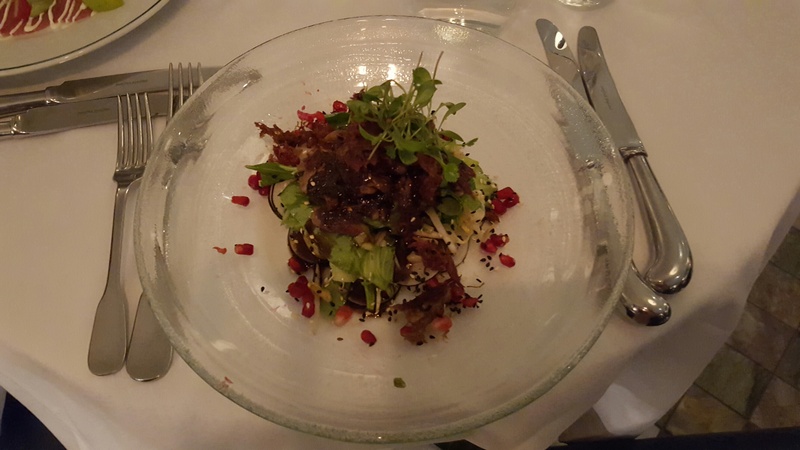 My five-spices duck salad was quite good, with bak choi, mache salad, and pomegranates, but my friend’s tuna carpaccio was a little flat. Since it is actually impossible to find reasonably priced fresh tuna in London, I can forgive the chef. But soon, the rest of meal made up for the tired tuna. 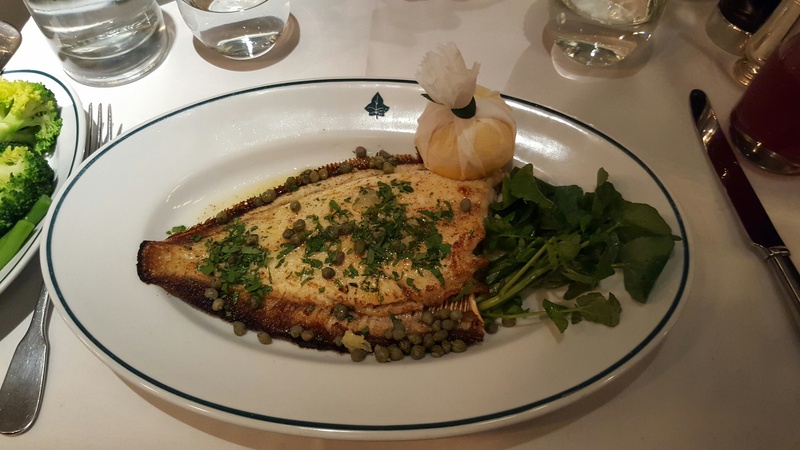 My dover sole was great, meaty, but light, nicely seasoned with capers and lemon, it has recently become my new favourite dish. And at £18.50, this is great value, compared to the £42.00 Dover sole at the Arts Club, which isn’t actually any better. 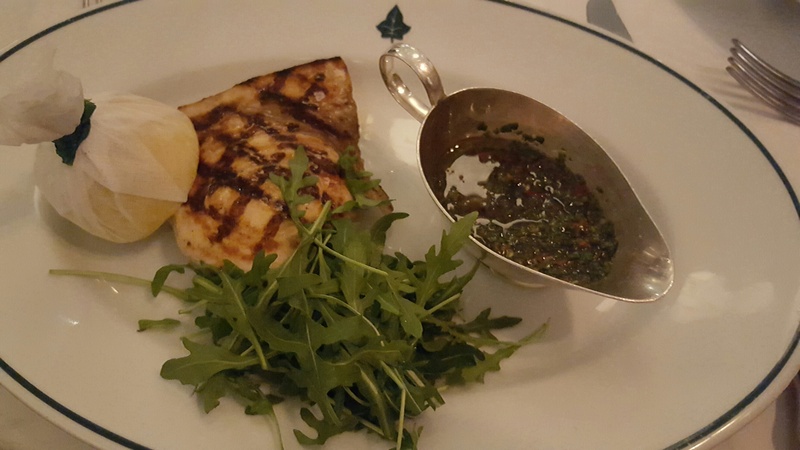 My friend’s swordfish was also very satisfying, with both dishes tasting so good, that it was hard to believe that we were eating rather healthily (It is January after all). A hard thing to accomplish. To compensate for this goodie, goodie healthy meal, we had sides of Zucchini Fritti, which were a bit on the oily side, but which of course made them delicious and gave us a guilty pleasure. All that healthy eating was soon forgotten when we ordered desserts. 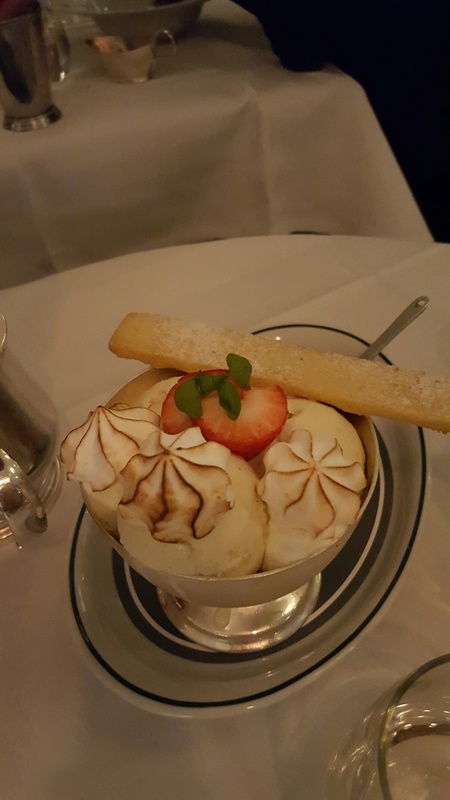 I ordered the chocolate bombe, and my friend ordered the Strawberry Shortcake. Both were a success. 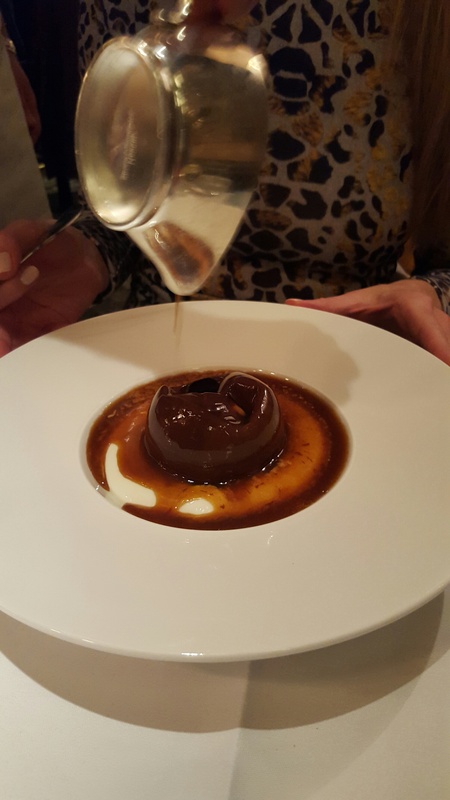 The chocolate bombe is a must-try for chocolate and caramel lovers. There is a ball of chocolate on an Ile Flotante, which opens up after hot, molten, chocolate sauce is poured over it, revealing vanilla ice cream, and snap, crackle, pop caramel inside. You’ve just got to try it. Divine. The strawberry shortcake was beautifully presented and equally as delicious that my friend was still dreaming about it the following day. There was a great vibe and buzz the night we were there, with a pleasing crowd of varying generations, from 30 year olds to 60 year olds. Couples, families, friends all having dinner, conspiratorially chatting away. It caters to all groups and all ages, which makes for a very comfortable setting. I ran into friends I knew, making it feel clubbish, and the service was very friendly and young (mostly young women I noticed). I particularly liked the design and the vibe, with an extensive enough menu that I will never get bored. The food is good, brasserie-style. It’s impossible for the food to be perfect with such a vast menu, but if you find a favourite dish, I would stick to it. It is a great new addition to the neighborhood. I loved it so much that I have already made my next reservation. Now, the only problem is that if I liked it this much, reservations will get harder and harder to get, so don’t spread the word.